Left to right: Elijah Alexander, Sara Bruner. Photo courtesy Jenny Graham and Oregon Shakespeare Festival. I happened to see the Oregon Shakespeare Festival’s production of Shakespeare’s comedy Twelfth Night on an early trip to the Festival in 2010. This year marked my first opportunity to see OSF produce a play I had seen here once before. Beyond the reframed setting of Twelfth Night, which shifted from a supersaturated Elizabethan era into the Golden Age of Hollywood, multiple adventurous changes in interpretation by the director and the actors demonstrate the versatility of Shakespeare’s language, as well as OSF’s capacity for experimentation. This season’s setting is a clever choice, playing off Twelfth Night’s themes of music, comedy, and love in fresh ways. Olivia is a calculatingly dramatic film star, Duke Orsino her director, and the remainder of the cast mostly the various hangers-on who have been basking in the light of the Hollywood elite since the first studios were established. Besides supporting the text, these new roles allow for off-script antics – including, of course, the glamorous musical number at the end of the show – similar to those in OSF’s excellent 2012 rendition of Animal Crackers. Along with the broader themes of the play, many of the individual characters develop in unexpected ways. Chief among these are Danforth Comins’ Sir Andrew Aguecheek and Rodney Gardiner’s Feste. While Shakespeare wrote the character Aguecheek as a gutless coward, Comins portrays him as a careless fop, never without a martini glass in hand, someone who isn't afraid of combat as much as he simply doesn't care for it. The humor in the script shines through with this variation, which allows Comins plenty of room to creatively interpret the part. Gardiner brings the same nervous energy that made him an incredible Nathan Detroit in last year’s Guys and Dolls. He creates a version of Feste that – surprisingly for one of Shakespeare’s fools – actually cares what other people think about him. Rather than an untouchable fountain of one-liners, Gardiner’s Feste is an average Joe who happens to have a talent for entertaining (and annoying) people. His performance demonstrates the endless permutations to which Shakespeare’s language can be taken, and the actor employs of broad theatrical talent when performing it. The rest of the ensemble also makes tremendous contributions to the work. Ted Deasy plays a stuffy, formal Malvolio who provides the most physical comedy out of the entire cast. Sara Bruner performs the roles of twins Viola and Sebastian with innocence and cheerful vigor. Elijah Alexander’s Orsino, adopting a German accent, assumes a high status over the rest of the cast – an interesting choice, considering the character is prone to be overcome by bursts of emotion. And Olivia, portrayed by Gina Daniels, hides her true intentions in as many ways as she has costume changes. Christopher Acebo’s gray-tone set matches the color scheme of 1930’s Hollywood; against this background, lighting director Robert Wierzel plays bursts of red and blue as needed for the emotional needs of the scene. Beyond the spectacle one would anticipate from OSF, Twelfth Night also includes tasteful film effects thanks to Shawn Duan – included throughout the play, the movies evoke the magic that turn-of-the-century audiences encountered when they experienced film for the first time. 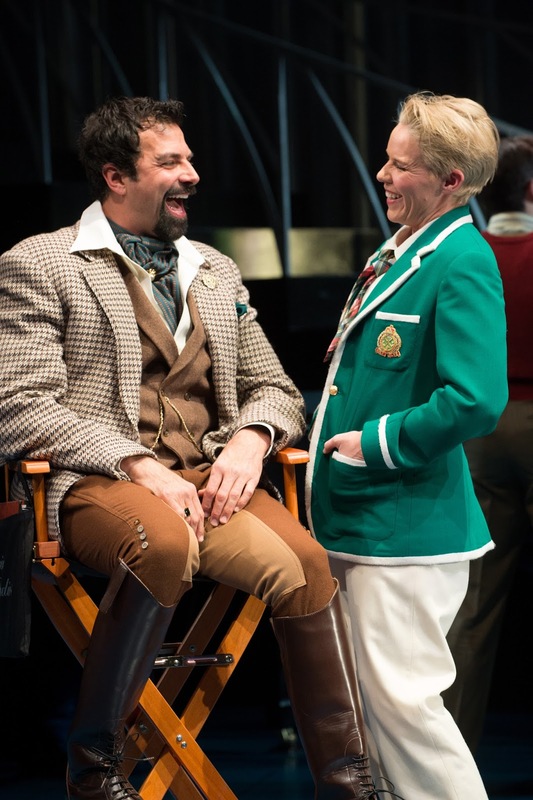 OSF’s 2016 production of Twelfth Night finds unique places to grow the text, but doesn’t stray so far from core themes to be unrecognizeable. The production is a symbol of the importance the Festival places on reimagining Shakespeare’s canon on both obvious and subtle levels. This capacity for change and the company's willingness to reinvent their voice each year, makes OSF a fresh experience season after season.